"If an angel were to descend from the clouds today, settle on the Qutub Minar of Delhi and proclaim from there that India will attain Swaraj provided Hindu-Muslim Unity is renounced, then I would renounce Swaraj and not sacrifice Hindu-Muslim Unity, because if Swaraj is delayed, it is the loss to India, but if Hindu-Muslim Unity is lost, it is the loss to humanity." These were the words of Maulana Abul Kalam Azad at the Presidential Address of the Congress Session in 1923. The analogy and juxtaposition of Swaraj and inter-communal harmony that Maulana Azad emphasized then is equally pertinent today. Maulana Azad, as it can be inferred from his above quoted statement, was a strong campaigner of peace and a vociferous freedom fighter. He used the power of his writings and public orations to create a national awakening among the masses. We shall briefly examine some of his prominent journalistic contributions which served as milestones in the Indian freedom struggle. Born on November 11, 1888 in a deeply orthodox Muslim family, Maulana Azad had his initial formal education in Arabic, Persian and Urdu with theological orientation. He also learnt English on his own. But Maulana Azad had a natural inclination for writing and this resulted in the miraculous start of the monthly "Nairang-e-Alam" in 1899 at Calcutta when he was hardly eleven years old. The periodical carried the poetical collection of the contemporary poets. This was followed by the launch of the weekly "Al-Misbah" in 1900 which carried articles on contemporary issues. But the genesis of Maulana Abul Kalam Azad's revolutionary journalism was in 1908. This was the time when he undertook an extensive visit of Egypt, Turkey, Syria and France. In Egypt, Maulana Azad came into contact with the followers of Mustafa Kemal Pasha who were publishing a weekly from Cairo. In Turkey, Maulana Azad met the leaders of the Young Turks Movement. The contacts between Maulana Azad and the leaders of Movement were further cemented by the exchange of letters between them which continued years after his return to India. Maulana Azad also interacted with the Iranian revolutionaries and famous French Orientalist Louis Massignon in Iraq. These contacts reaffirmed Maulana Azad's belief that Muslims in India should join their fellow countrymen against the British in the Freedom Struggle. He was of the view that the Freedom Movement against the British is the combined responsibility of all communities and hence it should be carried unitedly. With these thoughts in his mind, Maulana Azad started the "Al-Hilal" Press and a weekly by the same name. The "Al-Hilal" weekly was a landmark in the history of the press in India. Its circulation figures rose to 26,000 copies. Further, even back issues of this weekly had to be republished as every new subscriber wanted to hold all copies of "Al-Hilal". The message of patriotism and nationalism coupled with religious fervor inherent in the weekly gained wide acceptance among the masses. But these developments disturbed the British Government. In 1914, a security of two thousand rupees was imposed on "Al-Hilal" under the Press Act. When Maulana Azad deposited this amount, it was confiscated and a further security of rupees ten thousand was imposed. When these punitive measures failed to tone down the anti-establishment stance of the periodical, the government banned "Al-Hilal" and confiscated its press in 1915. Maulana Azad was not discouraged by this move. 1915, barely five months after the ban on "Al-Hilal", Maulana Azad started the publication of the "Al-Balagh" weekly. It was similar in its content to "Al-Hilal". The British realized that the provisions of the Press Act are not enough to counter the onslaught of Maulana Azad's writings. Hence the Maulana Azad was asked to leave Calcutta after the Defence of India Provisions were invoked against him in 1916. Punjab, U.P., Delhi and Bombay also prohibited his entry under the same law. Bihar was the only state in which he could move without any hindrance. But the moment he reached Ranchi he was kept under house arrest. This detention continued till December 31, 1919. He was released on January 1, 1920. In 1921 Maulana Azad started a weekly named "Paigham". But it was banned in December 1921 and he arrested. 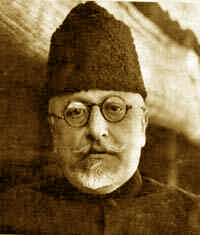 Maulana Azad's detention continued till January 1, 1921. In 1927, Maulana Azad restarted the publication of "Al-Hilal" and this weekly continued to be published till the end of the year. Apart from these publications, Maulana Azad was in the forefront in all the major movements for the independence like the Khilafat Movement (1919-23), the Non-Cooperation Movement (1920-22) the Civil Disobedience Movement (1930-32) and the Quit India Movement (1942). He was a strong advocate of undivided India and had the foresight to predict that the Urdu-speaking Muslims of India leaving for either East or West Pakistan will be marginalized by the local population. This has come true today when one looks at the plight of the "Mohajirs" in Pakistan and "Biharis" in Bangladesh. After India became independent in 1947, Prime Minister Pandit Jawaharlal Nehru inducted Maulana Azad as Education Minister in his Cabinet. Under Maulana Azad's tenure, a number of measures were undertaken to promote primary and secondary education, scientific education, establishment of universities and promotion of avenues of research and higher studies. On February 22, 1958 Maulana Abul Kalam Azad passed away. Pandit Jawaharlal Nehru described Maulana Azad as "a great man ' a man of luminaries, intelligence and intellect with an amazing capacity to pierce through a problem to its cause. The word "luminous" is perhaps the best word I can use about his mind. When we miss and when we part with such a companion, friend, colleague, comrade, leader and teacher, there is inevitably a tremendous void created in our life and activity." The Government of India celebrates the Birth Anniversary of Maulana Abul Kalam Azad on November 11 every year as Education Day. Maulana Azad National Urdu University was established at Hyderabad by an Act of Parliament in 1998 for the promotion of Higher Education with Urdu as the medium of instruction. These steps can be described as fitting tributes by the nation to a person who had unchallenged credentials as a freedom fighter, revolutionary journalist, social reformer, champion of communal harmony and an unparalleled Education Minister. I had gone through your article and found very interesting. Indeed Azad was a true patriotic and a secular leader of India. The way he fought till the end against the colonial rule and stand like a rock for the Hind-Muslim Unity, the only Congress leader who never compromise on this unity and was totally against partition. To liberate India from the British rule was a pious duty for him and that is why he once said, "It is my belief that liberty is the natural and God-given gift of man. No man and no bureaucracy consisting of men have got the right to make the servants of God, its own slaves, however, attractive be the euphemism invented for ‘subjugation’ and ‘slavery’, still slavery is slavery, and it is opposed to the will and cannons of God. I, therefore, consider it a bounden duty to liberate my country from its yoke". Aapka bahut shukriya Sharing and providing information about Maulana. Hazaron saal nargis apni be noori pe roti hai,Badi mushkil se hota hai chaman mein deedawar paida. Actually I have a question, did Abul Kalam Azad ever lived in Lahore during 1905 and 1913. Will certainly appreciate an any comment on the question. Thanks! He deposited a couple of chapters of his book "India Wins Freedom" with the State Bank of India, to be made public after his, Gandhi and Nehru's deaths. Would you please like to comment on their content?